"Saturday Night" was originally penned by Elton John (which is why it is actually a good song at its core) and Nickelback has turned it into a fist-pumping, rollicking tune perfectly capturing the mood of Saturday night hockey. I get pumped up when I hear it. 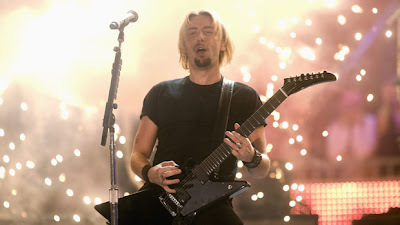 I really should still feel shame for not completely hating Nickelback with my entire being, but it isn’t really anything positive they’ve done to deserve this reprieve. Nickelback is just a beneficiary of perfect timing. For example, I was mortified upon learning the license to the original Hockey Night in Canada theme was not being renewed by the CBC. I was caught in the national uproar and felt CBC was being cheap, denying HNIC viewers Canada’s second national anthem. Well, I was wrong. It wasn’t the actual song that was so special. It merely benefited from being played before Saturday night hockey. Like Pavlov’s dog, I was conditioned. Instead of salivating at the sound of a bell, I was salivating at the triumphant "dun, dun, dun, dun dun". Now that TSN owns the license to the original theme it sounds cheap. One reason is because it’s been butchered by another Canadian embarrassment, Simple Plan. Playing it multiple times a week also cheapens it. I don’t feel the same excitement when I hear it. Saturday night has such a wonderful vibe surrounding it that I’ve associated the song into my feelings for the week’s best night. Hearing the theme not only gets me excited for hockey, but for friends, beers, laughter, and merriment. How can a song not succeed when it conjures up these emotions regardless of its composition? Playing the original theme for Wednesday night hockey only conjures up thoughts of going to bed to awake to an early work day. The real travesty is a Saturday without the Leafs even playing. I don’t care if they aren’t on the national game. I’m in the Toronto region; I get to watch them regardless. The NHL schedule makers decided it was a good idea to give Toronto a Saturday off. They did this three times last year and will do it once more this season after tonight. Is there any reason each Canadian team shouldn’t play on Saturday night? It’s totally unacceptable. Am I supposed to watch Montreal play tonight? The only sort of enjoyment I can gain is from cheering for injuries and that’s never really satisfying. Thankfully, they play Washington, so if I am lured into watching HNIC I will at least have the pleasure of watching the most dynamic player in the world.